Great Hires was a proud sponsor of the 2016 Talent Board North American Candidate Experience Awards Research Report. In the report there are some excellent insights into the end-to-end candidate experience. One of the areas that intrigued us here at Great Hires was the relative candidate experience of the selection/interview process compared to the other stages of the recruiting process. 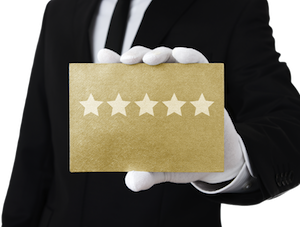 Candidates were asked to rate their overall candidate experience from one to five stars and the same question for each individual phase of the process. 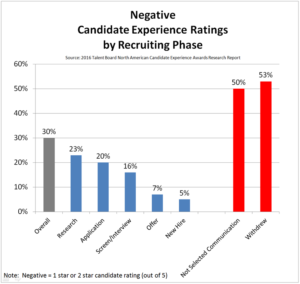 You can see from the chart below that candidates get treated better the further they move down each stage of the recruiting process with the negative ratings (1-star and 2-star ratings) going down each phase. It shouldn’t be surprising that candidates get treated better as they progress down the recruiting funnel and the company gets more serious about wanting the candidate to join their organization. What is a surprise is how much the negative ratings spike after either the company or the candidate decided they aren’t right for each other. 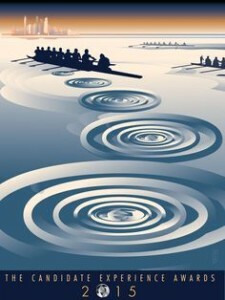 The report suggests candidates are looking for better ways to be told they aren’t moving forward when they are rejected. 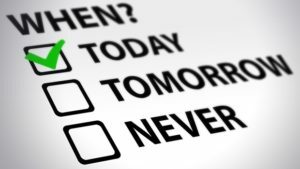 In addition, candidates who are withdrawing cite their time being wasted for appointments/interviews and the process taking too long as their primary reasons for taking themselves out of consideration. 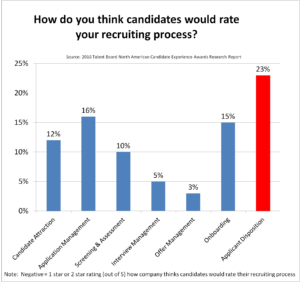 What is even more surprising is the self-perception gap between how companies think candidates rate their recruiting process vs. how candidates actually see the process. 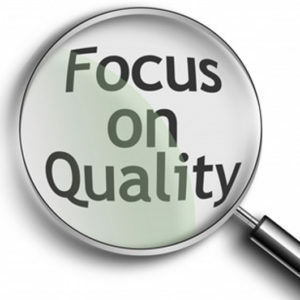 Across each stage of the recruiting process there is about a 10 point difference between the companies self-evaluation compares to the actual candidate feedback. By far the biggest disconnect is in how candidates rate their experience in being told they are no longer in consideration for the job: 23% negative via company self-assessed vs. 50% negative from actual candidate ratings. 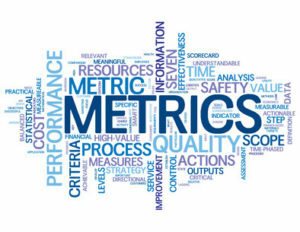 The data suggests that most companies need a little reality check. In our next posting, we will consider where talent acquisition teams are currently investing their resources/dollars in the candidate experience and why. We’ll also propose how they might want to shift these allocations based on a holistic view on the impact of a bad candidate experience. 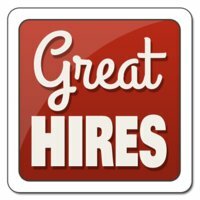 Author Ray TenenbaumPosted on March 13, 2017 March 13, 2017 Categories Candidate Experience, Candidate Selection, UncategorizedTags candidate-experience, interviewing, recruitment, talent acquisitionLeave a comment on Candidate Experience: The more we’re interested the better we treat you. Until we don’t. In the first two articles of this series we discussed the role of people and process in the success of the candidate experience. Without getting alignment in your organization with these two components first, the tools you choose will have limited impact. The tools you choose for your candidate experience may already be part of the enterprise-wide solutions offered by your company, or point solutions you choose as a recruiter that match your personal best practices. 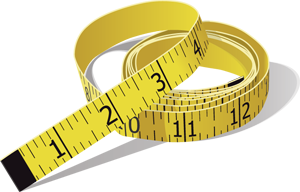 Measurement – How are we doing? Note: Talent Tech Labs produces an excellent quarterly map of the recruiting ecosystem if you are looking for an overview of the key players grouped by segment in the talent acquisition field. Benchmarking the current state of your candidate experience should be your starting point. 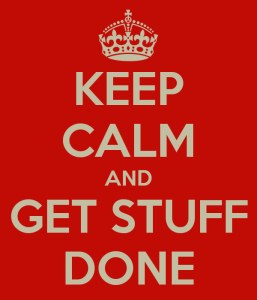 To do so, you need to act like a marketer. 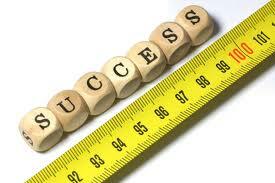 Not only do you need to listen to your customers, candidates, but you also need to watch and measure their behaviors. Listening to candidates is relatively simple and can be done qualitatively via follow-up interviews and anecdotal comments and quantitatively with surveys that include standardized measurement techniques like the Net Promoter Score. 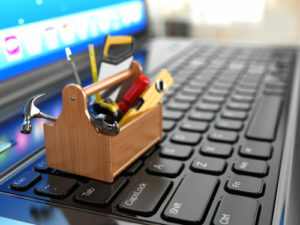 There are hundreds of vendors who offer a variety of survey tools (e.g. 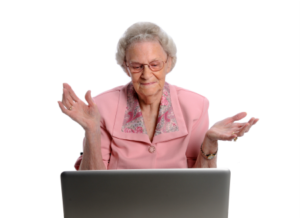 Google Forms, SurveyMonkey, Formstack etc. ), the challenge is less about the survey, and more about a) getting it to candidates in a timely and automated way and b) aggregating and analyzing the data. Integrating the survey into your contact management tool with candidates, whether it is as simple as email or the auto-generated messages sent from your ATS is critical to capturing the data you are trying to collect. 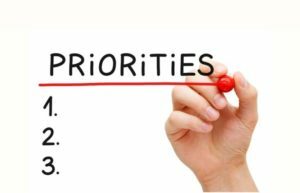 In addition, spending time figuring out what the data says about your people and process should be driving your priorities to improve. Thanks to digital technology it is much easier to measure candidate behavior when it comes to talent attraction and the application process. By applying online marketing practices to these stages in your candidate experience, you can quantify exactly how effective your candidate experience is. The recruiting process is very similar to the sales funnel for an online service (e.g. ecommerce site or SAAS solution). Near the top of the funnel, when a candidate comes to your landing page (e.g. the job description), you should be measuring the click-thru-rate to start the application process. From there you can measure abandonment rate at each step of the application and your final conversion rate (completed applications). This is no different than what a marketer would do using Google Adwords to sell a specific product on an ecommerce site. 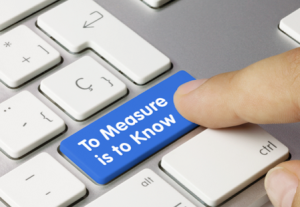 There are a variety of tools to help measure and optimize click-thru rate and conversions. A few well-known vendors in this space include Mixpanel, Optimizely, Qualaroo and KISSMetrics and can be used for both desktop and mobile experiences. 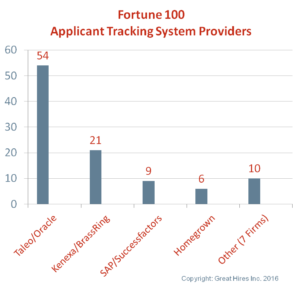 At the end of the day, if you are seeing very low application completion rates, it is very clear you have a problem, but at least you now have visibility about where to look to determine the root cause. Now that you have collected both qualitative and quantitative data on your candidate experience, you need to pick the opportunities to focus on first where you can get the biggest bang for your buck. This should not just focus on the talent attraction and application process, but end-to-end, including the other three phases described in the Candidate Experience report: Screening & Dispositioning; Interviewing & Selection; Offer, Onboarding & New Hire. If you are only using your corporate HR/Talent acquisition tools have made available to you, you probably aren’t winning the battle for talent. Whether you are using an old-school, clunky enterprise ATS or one of the new-wave of recruiter-friendly solutions, it is very unlikely your ATS offers a complete set of features needed to solve your high priority candidate experience problems. This creates the natural tension of using your integrated ATS solution vs. point solutions which would typically require double-entry of information and aggregating multiple sources of data for analysis. Unfortunately, this is the reality of recruiting tools in 2015, but a little extra effort on your point can differentiate both your candidate experience and yourself as a recruiter. This can be solved by both making the information easy to find and consume by making your job details . In addition to providing additional information about the job or company which can include videos and other types of rich media. There are a variety of ATS and point solution companies that can help with employer branding, job distribution and mobile recruiting (e.g. 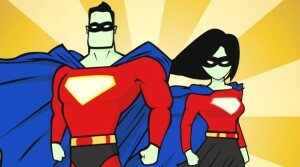 CEB, Jibe, Smashfly). We previously discussed optimizing the application process to only focus on value-added activities when applying. The challenge is usually in the lack of flexibility of your online application form tool or a “corporate recruiting tax” that requires all applicants to supply information that really isn’t needed at this stage of the process. Take the time to figure out which steps/fields truly add value to the application and update your tools accordingly. 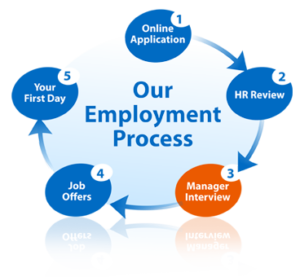 This is really about people and process and making sure your ATS (or whatever tool you use to manage your applicant database) has the ability to respond automatically to a submission, but also provides additional information about the full hiring process, the company and what to expect next. This is pretty standard stuff and should be considered table-stakes for your application management tool. Depending on the types of challenges you find, it can be anything from interviewers showing up late, poorly prepared interviewers who don’t know enough about the job or candidate, or ask poor questions during the interview. 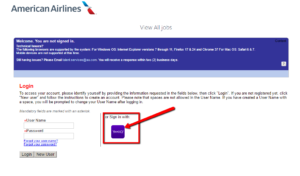 Beyond email and embedding calendar event with pdfs and blue links, there are various interviewing tools already available in your ATS and there are others that can help with scheduling and interview guides. Another source of a bad candidate experience are hiring team member who basically exhibit behaviors the lead the candidate to believe that they just don’t care – this is a people problem that no tool can solve. The data you collect about your complete candidate experience should reveal the causes of delay in decision making. 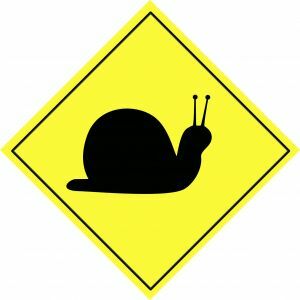 A couple of the more common sources of slow decision making are firstly, slow compiling of interview feedback from the hiring team. Typically, less than 30% of interviewers submit digital feedback whether by email or completing a standardized form. Mobile friendly feedback forms and automated nag reminders from your interview management tool are simple ways to accelerate decisions and reduce time-to-offer. Secondly, delays can be caused by the natural timing challenges that occur when you have multiple good candidates in parallel processes with but one candidate is a week or two ahead of a second. The first candidate typically does not enjoy stewing while they wait on you to figure out if you like the other candidate more than them. A specific tool likely won’t help solve this challenge, rather your people and process should kick in. Engaging with the candidate that is on hold to give help with transparency and also to make sure you keep you in synch should they may move on to another opportunity while you play the waiting game. Having a good candidate relationship management tool to track exactly the status of each candidate is the only way to make sure they are getting a personalized experience. In an ideal world your ATS would be make this super-easy. However you may need to find a point solution of your own if your specific candidate management needs aren’t being met. Instead you may consider more generic CRM tools like Salesforce, Sugar CRM, Zoho or Avature. These tools tend to be easier to use and you can configure the various fields and notifications to match your own recruiting practices. 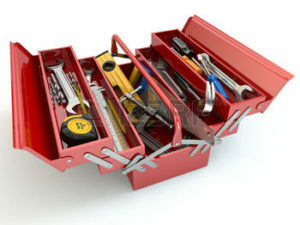 There are literally hundreds of tools available to help you with your candidate experience. 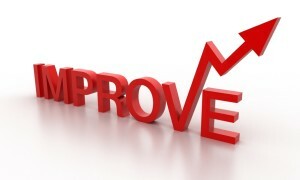 Some designed specifically for recruiting, others designed for sales or marketing that can be applied to your process. 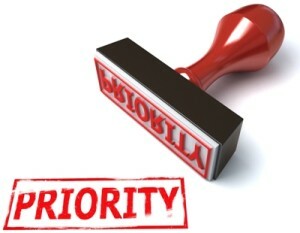 What matters most is that they solve a high priority need and give you bang for your buck. Given the many self-service solutions now available, trying them out for 30 or 60 days will give you enough data to see if they are worth your investment of time and energy. The average number of employees in the F500 is about 69,000. 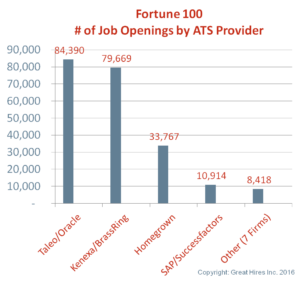 Assuming 15% of the total workforce is close to the number of annual hires, and each filled-position interviewed 2.5 candidates, then, on average, 25,000 candidates are interviewed each year for an F500 company. 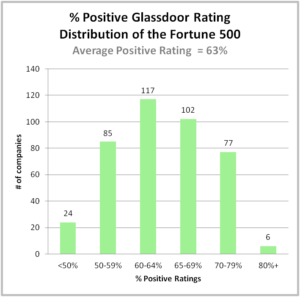 With a mean of 481 cumulative reviews collected since Glassdoor started, then it is easy to see how less than 1% of interviewed candidates actually post feedback on Glassdoor. Thus, similar to Yelp, the critical few have a big impact on the many candidate readers. 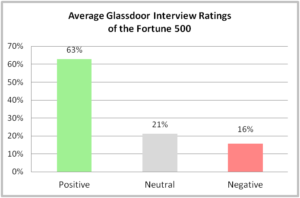 I have heard many recruiters hypothesize that most candidates only go to leave feedback on Glassdoor if they had a bad experience. The data clearly does not support this perspective. In fact, the mode is also 63%, thus almost two-thirds of all reviewers had a good interview experience. On the flip side, there are only a handful of companies who crossed the 80% positive threshold. This tells me that there is still long way to go for almost every company to improve their candidate interview experience. Note: Graphic excludes 19 companies where the number of reviews was less than 30. While a 16% mean negative rating may not seem like much, let’s look at the math if you are a consumer-oriented company. If a company is interviewing 25,000 candidates, and the 16% is a statistically representative sample, then about 4000 candidates are unhappy with their experience. Not only might they tell friends and colleagues about their bad experience which impacts other potential hires, but losing even half of those customers (2000) for a lifetime could be worth millions of dollars in lost revenue. It’s pretty easy to do the math on why investing a little more in the candidate experience has a positive ROI. 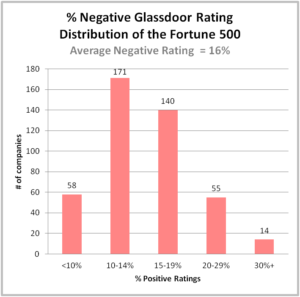 Glassdoor’s feedback methodology isn’t that helpful for employers. While I realize Glassdoor wants to make it super-simple for candidates to submit feedback there are a couple of glaring issues with the form for how employers can use the data. The 3-point scale ‘Rate the Overall Experience’ is oversimplified to provide differentiated statistics. Using the Net Promoter Score scale would provide more meaningful, standardized data to use for analysis. Similarly, Glassdoor’s current method of capturing open-ended feedback relates to their ‘Describe the Interview Process’ question with additional ‘Briefly describe the interviewing and hiring process’. While this is helpful to set expectations for other candidates to know what to expect, it does not consistently guide candidates to detail what went well and didn’t go well for their interview experience. Here are some good examples where candidates detailed answers were very helpful. Unfortunately, a majority of the time, candidates detail the process steps without adding an explanation for their rating. Putting in an additional text field after the rating scale with the question ‘Why did you give this rating?’ would be helpful to both candidates and employers. After reading hundreds of negative reviews, one pattern that I noticed, is that many times a candidate detailed interactions with several interviewers and had multiple positive experiences. 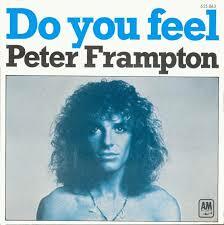 But then it took just a single bad event, like an interviewer acting unprofessional (e.g. didn’t read their resume before showing up, didn’t apologize for being late etc.) or the recruiter didn’t follow-up in a reasonable amount of time for all that goodwill to be forgotten. This shows how a great candidate experience is only as strong as its weakest link. Interestingly, all three have a consumer-orientation which means that many of the candidates they interview are potential customers they might lose for a lifetime. Netflix is especially curious because of how much press they have received about being a progressive company with their HR practices and forward thinking culture. While the bar may be high to join the company, given the subscription nature of their offerings, one would think they would invest a lot more in ensuring a great candidate experience. (Note: I interviewed at Netflix back in 2002 and had a great experience. I still remember the process in detail, including some elements which I have since borrowed when I conduct my own candidate interviews). So what’s the opportunity for your company? 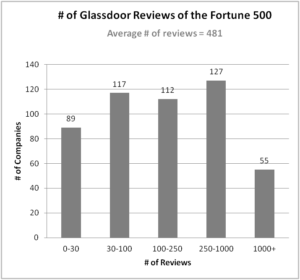 My key take-away from this analysis is that it is still early in the game for companies to shape and change their Glassdoor interview ratings and reviews. By both improving their candidate experience and leveraging new ways to encourage candidate to leave feedback, employers can drive up their positive feedback rates to improve their employer brand and candidate perception.